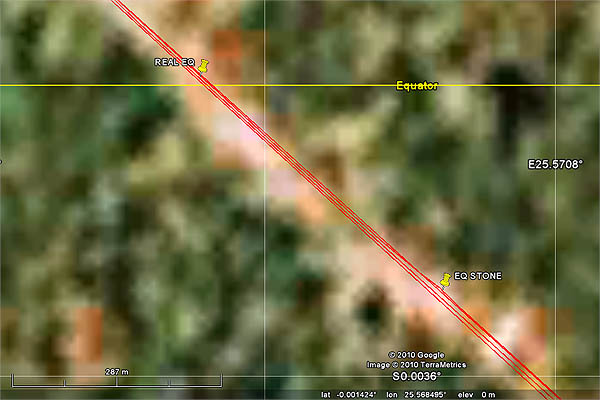 At 6am on Monday the 24th of May, I woke up in Lubutu, 0.44° south of the Equator. I spent a couple hours at the office assigning tasks to the logistics team, checking emails, and making sure repairs of the paillote (thatched hut) for our new generator were progressing well. At 9:44am I set off in a yellow Merlin pickup truck for Kisangani, accompanied by (or perhaps accompanying?) Pam, one of our project coordinators, with our head mechanic in the driver’s seat. At 11:07am, at 0.36377°S, 25.95470°E, two adult goats ran across the road in front of us. A second later, a baby goat decided to follow the bigguns (a baby goat is called a kid but use of that term here could be confusing and start bad rumours). At 11:08am we explained apologetically to the dead baby goat’s owner that it had run out suddenly from the tall grass and it had been impossible to avoid running it over. The owner accepted our request for forgiveness, apologetic handshakes followed between us and him and several witnesses, and at 11:10am we were moving along the road again. 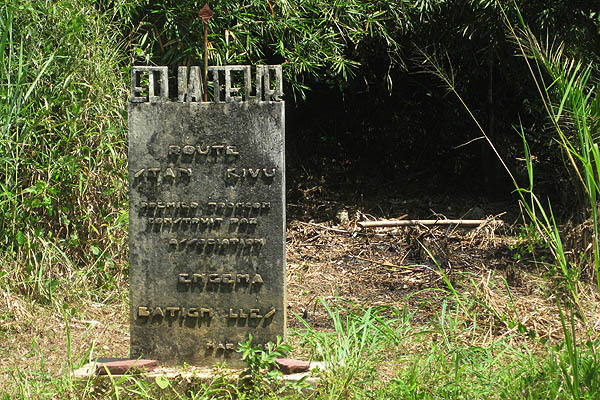 At 12:25pm we stopped at a cement marker erected to mark the Equator, dividing the Northern and Southern Hemispheres. However, they accidentally placed it at 0.00253°S, about 280m south of the Equator, according to my GPS unit and verified using Google Earth. At 12:26 we crossed the real Equator into the Northern Hemisphere. We were soon seated at a small restaurant table drinking cold Fantas for a third the price they cost in Kindu. Our driver left the restaurant around 3pm to book hotel rooms, as we didn’t have time to get our work done and still return to Lubutu before nightfall. Sometime after 4pm our driver finally returned, with two police officers. It turns out our pickup truck’s government-issued legal papers had a single-letter typo in the licence plate number, which was enough for the police to try and get a bribe out of us. Pam convinced them that we would meet them at the police station nearby, where we had a five minute wait and a two minute chat with their friendly boss, who promptly let us go. Five minutes afterward, we were stopped by traffic police in a different part of town and again told that our documents did not match our plates. Pam convinced the three cops to give her their boss’s phone number and called him. After a quick chat to explain that she was the mzungu who had recently been in his office, she passed the phone to the seniormost member of the traffic cop trio and after what could have been no more than 3 words, the phone returned to her hands with an apologetic smile and we drove away. Around 8pm at a high-end (i.e. $20/dinner) restaurant, Pam and I both received fish filets. At around 830pm we each received the delicious beef steaks we had ordered, orders which somehow had been confused by the restaurant staff. At around 930pm I took a shower that did not consist of dumping small buckets of brown water over my head, a nice change for a day. At 11:05pm I finished handwriting this blog post on scrap paper, then fell asleep to the uneven drone of an old fan spinning and whistling and groaning as it girated back and forth on the wall. 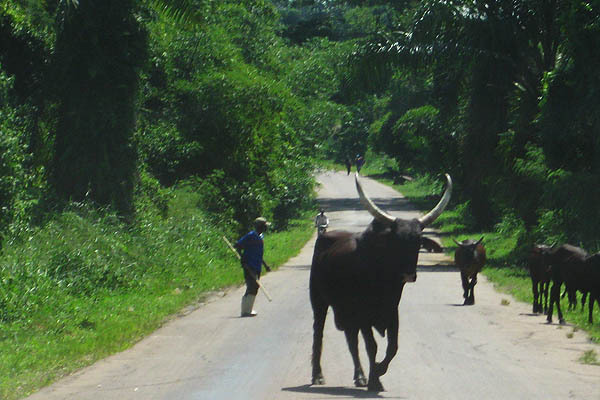 A relatively normal day in the Democratic Republic of Congo. 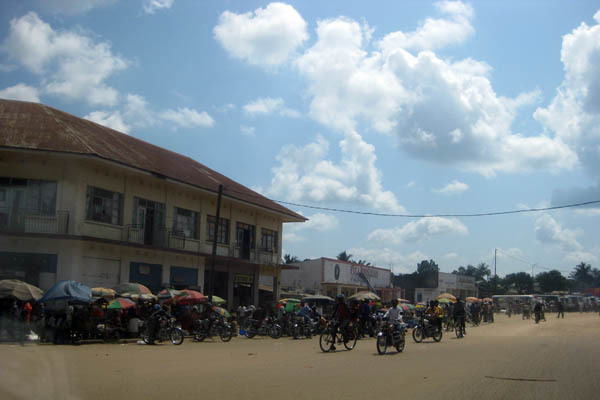 Addendum: Just before 10am on May 25th, on our way to pick up 85 litres of motor oil, we were stopped by Kisangani police officers for the third time in less than 24 hours, for the same reason as the day before. Pam pulled out her phone and asked if they wanted her to call their boss, whose name and number she had saved to her contact list. With smiles on their faces they immediately replied that it wouldn’t be necessary and wished us a pleasant day as we drove off. This entry was posted in Africa, Democratic Republic of Congo, Humanitarian and tagged Equator, Kisangani, Merlin, Police.